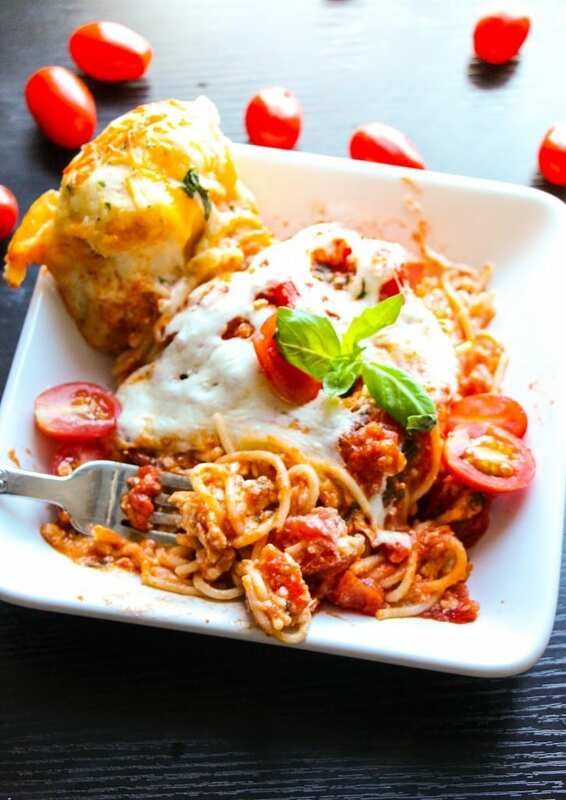 Homemade baked spaghetti covered in warm skillet bread – all smothered with melty mozzarella cheese. AMAZING and a great family-favorite meal! Today I am sharing a super comforting and delicious Warm Skillet Garlic Bread with Baked Spaghetti recipe with you. Yeah you read that right, garlic bread baked WITH the spaghetti. It’s only our first recipe we are sharing with you and you probably already think I’m crazy. But let me tell you, there is actually nothing crazy/complicated about this dish – it’s actually super simple and quick, thanks to the no-rise dough used for the cheesy bread! This baked spaghetti recipe alone is a family favorite – the flavors, the texture, everything is so good. We use cottage cheese instead of ricotta in our baked spaghetti because I think it keeps the spaghetti from getting too thick or dry. The dough recipe I used for these rolls is the dough I use for almost all of my bread recipes. It makes the most amazing, softest, fluffiest bread no matter what. AND there is no rising time. It’s a pretty awesome dough if you ask me. 🙂 Instead of doing plain jane rolls for this dish, I kicked it to the next level and add cheese chunks to the dough. Do it. It takes .25 seconds and you are left with the most amazing melty cheddar cheese bursts all throughout the roll. A ring of rolls + a center filled with spaghetti + baked to perfection = happy tummies everywhere! From start to finish, this spaghetti can be done in a little over an hour; and let me tell ya, this is one shop stopping, secretly easy dish to impress your family with. When you break it down, this recipe is actually quite simple. 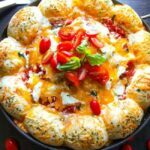 Even more simple than per say making a baked spaghetti and homemade rolls because this recipe only uses one less dish! 1. Make sure your yeast isn’t old! Old yeast will make the rolls really dense and not soft and fluffy like we want them to be. 2. Speaking of yeast, make sure you use 1 whole tablespoon. This is more than a single yeast packet (1 1/2 teaspoons), about 1 1/2 yeast packets. Trust me, it makes all the difference. 3. Don’t be scared of kneading! Kneading makes bread and rolls light, airy, and chewy. It’s a crucial step in making yeast breads and it so easy to learn… I learned from this video. Watch 0:25-1:10. The video says to knead the dough for 6-8 minutes, but this dough really only needs about 1-2 minutes. 5. If the rolls start getting too brown, tent foil over the skillet. In a small bowl, stir together water, yeast, and sugar. Some clusters of yeast will remain. Let yeast/water rest for 5 minutes. The yeast should multiply and rise to the top. In a standard mixer, fitted with the dough hook, combine 3 1/2 cups flour and salt. Slowly add yeast/water mixture to the mixer and mix for 2 minutes. If dough is super sticky add small amounts of flour until dough stops sticking to sides. I had to add about 1/2 cup more. Do not add more than 1/2 cup. Add the cheese and mix until just combined. Turn the dough out onto a floured surface. Knead the dough for 1-2 minutes (see post for a video explaining how to knead) and shape into a ball. With a sharp knife, cut ball of dough into thirds and then into fourths to make 12 balls of dough. Knead each dough ball a couple of time to get a smooth skin and shape into a ball. Set aside. In a small bowl, whisk together cottage cheese, 3/4 cup mozzarella, egg, 1/2 cup parmesan, heavy cream, and cornstarch. Set aside. Make pasta according to package instructions. Set aside. While pasta is cooking, heat oil and garlic in 10-12 inch skillet over medium heat, for about 2 minutes. Stir in tomato sauce, diced tomatoes, and oregano; simmer until thickened, about 10 minutes. Off heat, stir in 1/2 cup basil and sugar, then season with salt and pepper. Reserve 1 cup pasta sauce, and add remaining sauce and cottage cheese mixture to pasta. Stir until evenly distributed. In the skillet used to make the sauce - place the rolls in a ring around the outside of the pan. It is okay if there is a little bit of sauce still in the pan. Brush tops of rolls with beaten egg whites, sprinkle with parsley flakes and remaining parmesan cheese. Add the pasta to the middle of the pan. Top with reserved sauce and remaining mozzarella cheese. Bake for 40-45 minutes. If the rolls start to get to brown, lightly cover skillet with foil. Remove from oven and let cool for 10 minutes. Slice like a pie and enjoy! This looks amazing, Chelsea! I’m totally craving this for breakfast right now. 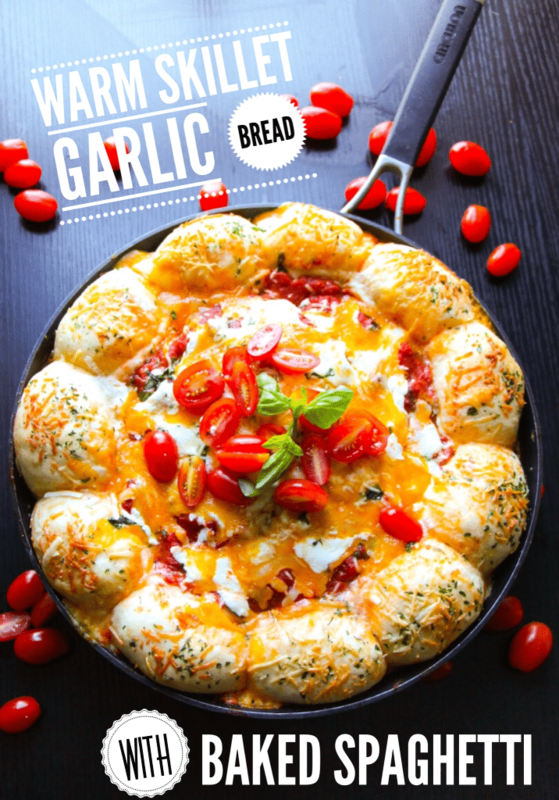 This cheesy bread sounds so delicious, especially since it’s made in a skillet. And I love the baked spaghetti, too! Definitely a meal that my husband would devour. Pinned! This looks amazing, Chelsea! 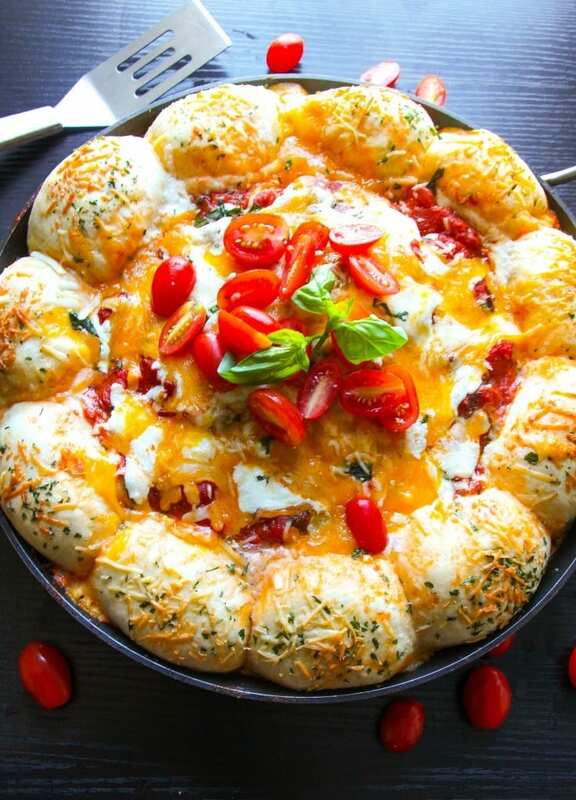 I’m a huge fan of pasta and you combined it with cheese bread in a skillet! Love this. 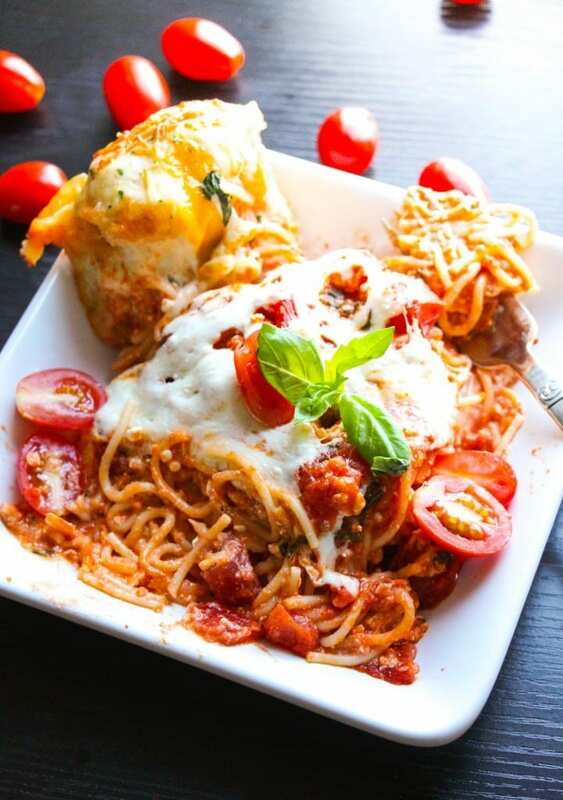 Baked spaghetti is already amazing but this is a whole new level of incredible! So pinning! Emily, this recipe sounds good. Like something I would love to do for a nice Sunday dinner with the family. Your other recipes look inviting as well. I’m going to check them out. Especially the PF Chang’s lettuce wraps, we love them. Thanks to you and Chelsea for sharing. I literally love everything about this. It sounds SO GOOD!!! This is GENIUS! This is the type of meal that I totally want to splurge on – loads of calories, that’s ok. It just looks too good to pass up! Thanks Emily and Chelsea for sharing! YUM!!! This looks so insanely delicious!!! I’m a huge fan of anything bread, cheese and spaghetti so this is pretty much perfect for me. ooooooooooh garlic bread AND spaghetti in one dish??? I’m in love! What a FUN idea! I’ll bet kids would go crazy for this! whay size pan would be good to use? I made this tonight for dinner. It’s simple and very yummy! I already had dough made to I just added a chunk of cheese to each ball. Then I brushed the tops w/ garlic butter. Warm, bready cheesy goodness. My husband’s face just lit up when he saw it. Thank you for sharing. Is there something missing in the recipe? It says 1/3 cup basil leaves, etc and then in the directions, it says 1/2 c of basil & 1 tsp sugar–the 1/2 c is more than what it says in the ingredients. Where is the error? Why so much basil? The ingredients list calls for 1/3 cup, and the instructions call for 1/2 cup. Which is right, and why so much? Teaspoons maybe, not cups of the stuff…. After chopping 1/3 cup of basil it doesn’t look like much. I think there is a typo and it is just 1/2 the basil in the mix and sprinkle the other half on top before baking. This is my educated guess. Hi there! I made this a while back and it was AMAZING!! PROPS TO YOU!! Plus it was freakin gorgeous and looked like a straight up masterpiece. ANYWAY! Tonight I’m doing a different pasta, but I loved the garlic rolls so much I’m making them by themselves. Its probably a little late to ask, as they are already in the oven, but how long should I bake them for?? Do they need the full 40 minutes? If they look browned on the outside, does that mean they are done on the inside? I guess I may just have to sacrifice one, to make sure its done. I’m so happy you enjoyed this dish Kim! 🙂 I’m SO sorry for the delayed response, but yes I think they will be done sooner than the 40 minutes. I hope you were able to figure it all out! This dish is currently in the oven. The smell and sight of it is AMAZING. I can’t wait to have my first taste. I took out the cottage cheese as I don’t love it and added garlic powder to the rolls. Otherwise, followed your recipe to a tee – I’ll comment later with how it turned out for me (not sure if I can last 40 minutes! ).